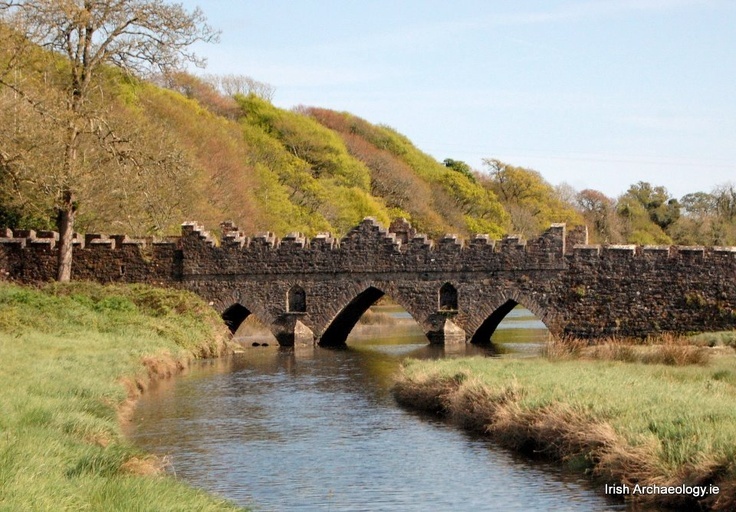 This rare, surviving, example of a 16th century bridge is found at Tintern in Co. Wexford. Located over a small, tidal river, the bridge is situated just a short distance from the impressive ruins of Tintern Abbey, which was founded in the 13th century. It has three plank-centred arches[i] and is a defended by a crenellated parapet. Made from locally sourced stone, the entire structure measures approximately 16m in length by 4.95m wide. The bridge is thought to have been built in the mid-16th century[ii] at the behest of Sir Anthony Colclough[iii]. Originally from Staffordshire, England, Colclough was granted Tintern in 1543 after the monastery was dissolved by Henry VIII. He soon set about defending his new possession and in 1566 he requested funds to fortify the Abbey and surrounding lands[iv]. 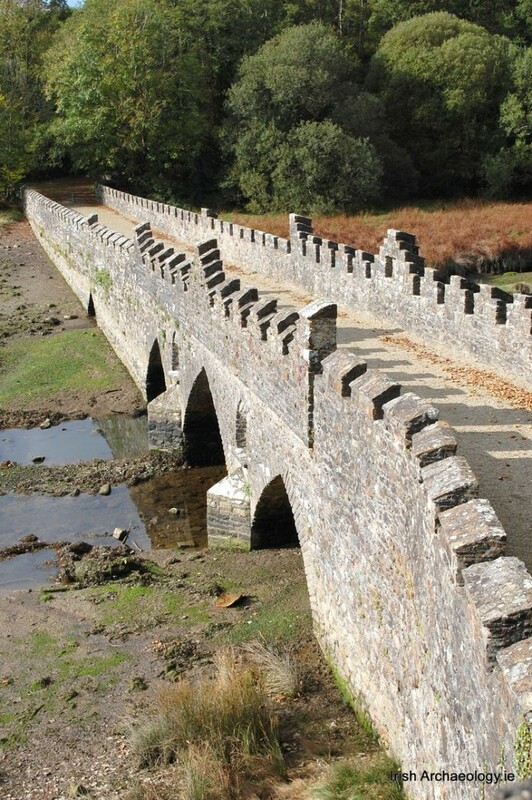 This phase of defensive works is probably when the distinctive crenellated bridge was built, with further modifications likely to have occurred to the structure during the 18th century. [i] The presence of plank centring may indicate that the 16th century bridge was built over an early structure which was contemporary with the nearby 13th century monastery. How interesting! A most unusual bridge. And I didn’t know that there were two Tintern Abbeys; there is another in Wales, on the River Wye, painted by Turner. Wordsworth wrote a poem inspired by the Wye Valley and the abbey. The one in Wales was a Cistercian Abbey and was also dissolved by Henry VIII. 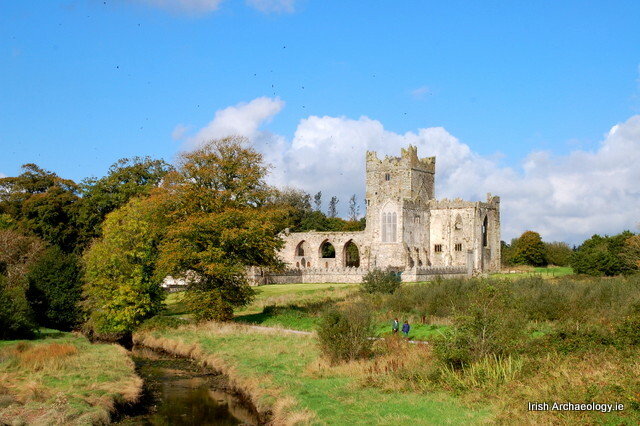 So I’ve just done a little research and I find that the abbey in Wexford was founded by the patron of the Welsh abbey — William Marshal, Earl of Pembroke and Earl of Leinster — after he was nearly shipwrecked in 1200, and that it was colonised by monks from the Cistercian abbey at Tintern in Wales.